I’ve been having a lot of those ‘it’s so nice to have older kids’ moments lately. You know, those times that hit you as you all spur-of-the-moment go out to eat, and don’t need to pack sippy cups or diapers ahead of time. When you go to a friend’s house, who also has bigger kids, and they go off and play, leaving you ADULTS to chat and enjoy a glass of wine. It’s a nice place, having kids that are pretty independent. I had one particular day like this last weekend. 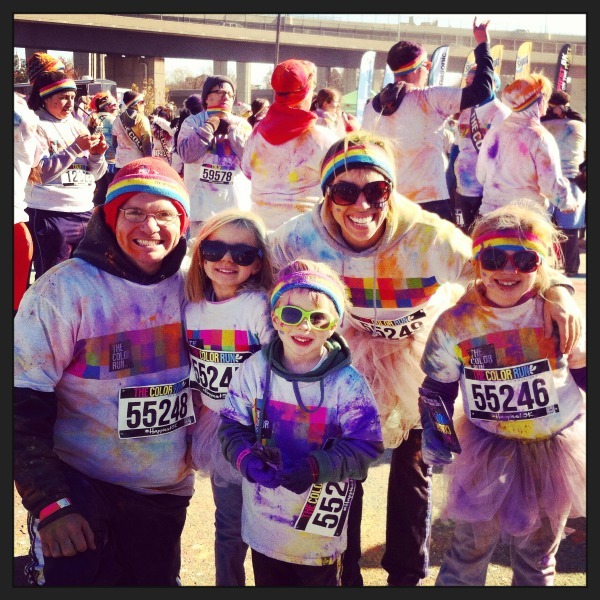 Our family did the Color Run. We woke the kids up, they bundled themselves all up (it was like 20 degrees or something awful), we drove downtown, walked/jogged the 5K, all the while, they smiled and had a blast. There was no ‘waiting for them to melt down’ moments. No ‘it’s getting close to naptime, they’re gonna LOSE IT’ moments. Then, when it ended, a big group of us decided to go out to eat. The kids were rock stars. Adults at one table, kids at another. Playing tic-tac-toe on their paper placemats together. THEN…one kid went to a soccer playoff game, another went to a birthday party where he also spent the night. WE’RE AT SLEEPOVERS NOW, PEOPLE. I felt happy with our growing up places. This is nice, I thought. Fast forward a couple days and I’m at the pediatrician’s office with my oldest for her 8 year checkup. We sat there in the waiting room, admiring the baby sleeping, with the mom and grandmom there, just beaming. We sat there, talking about how precious the toddler was, playing with the puzzles. Probably close to two years old. And positively adorable. I suddenly couldn’t believe we were where we were. I blinked, and suddenly we’re this family with independent, bigger kids…who SLEEP OVER AT FRIENDS’ HOUSES. For as awesome as it all is, I was sad that mom holding the baby and playing puzzles with the toddler wasn’t me anymore. The nurse called my daughter’s name to come back. She did the usual checkup tests, and everything was great. My daughter is healthy and amazing, and I felt so thankful. Then the doctor looked at me, and saw the mixed signals on my face, as my smile was paired with sentimental eyes. In some – most – ways, I’m so glad we’re in this place. In some ways, I think a part of me will always miss what once was. The simpler days, before heartbreak and mean girls and not knowing where they are at every moment. When I would just hold them in the glider, rosy cheeks still warm from naptime, feeling all was SO right with the world, right here, in this moment. We walked out of the room, and heard that baby screaming – wailing, in fact. Ugh, I remember those appointments well. We watched the mom trying to pry the toddler away from the puzzle, clearly in a power struggle as those Terrible 2s were showing themselves in all their glory. I remembered how headstrong they were at that age, and the public tantrums that would leave me feeling so deflated. My daughter zipped up her coat, and I put my hand out. She held my hand as we crossed the parking lot, and I smiled, enjoying every second while she’ll still let me. Sobbing in my car as I read this, waiting to pick up my 3 from school— I’m there. I’m right there. Well, sort of. I’m in between. I have an 8, 5 and 2 year old. Just when I can’t take anymore, I want to run, scream and hide. Praying for a day when there’s no fighting, when it’ll just “click” and they’ll get it, when they won’t be so “needy”… I look at my almost 8 year old boys hands– they’re huge! And he’s so handsome, such a big kid now… And then I sob!! I often say that being a mom is the worst best thing ever. And it is. Thanks for this post today. Beautiful! You have such a way with communicating this “mom stuff,” Liz!